The Union Pacific West (UP-W) Line Third Mainline Track Project will remove a critical bottleneck along the UP-W Line where only two tracks currently exist. When the third track is completed, it will provide a variety of benefits to Metra passengers, Union Pacific (UP) freight operations and local residents by reducing motorist wait times at grade crossings, decreasing commuter and freight train delays, decreasing idling freight trains and enhancing overall safety. The construction of the third track will occur primarily within UP’s existing right of way. It will include improvements to current at-grade railroad crossings at 3rd Street and Western Avenue in Geneva, along with improvements to Route 31 (1st Street). The project also includes reconstruction of three existing commuter parking lots on the south side of the Geneva Station to accommodate the addition of the third track. The parking deck at the Geneva Station was recently expanded to accommodate this project. Construction is anticipated in the second quarter of 2019 and is estimated to take about 19 months to complete. The addition of the third mainline track is the fourth and final phase of the overall UP-W Line Improvement Project. 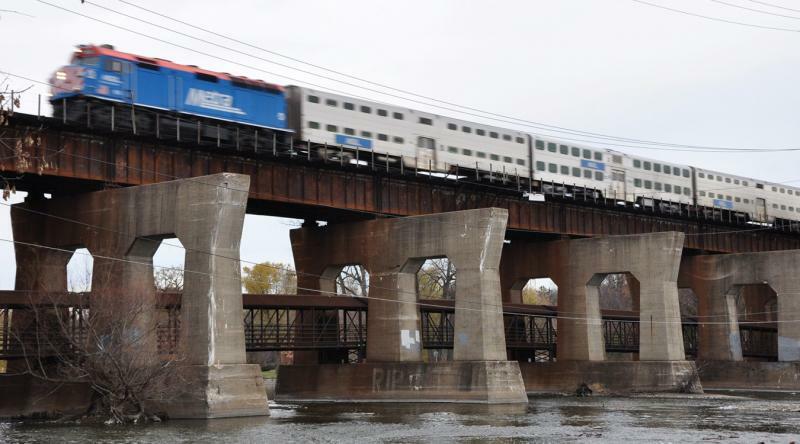 For both the West and East Sections of the final phase of the Project, the total design and construction cost of over $100 million will be jointly funded by UP and Metra, through grants received from the Illinois Department of Transportation. Previous phases included safety upgrades, new crossovers so trains can switch tracks and an upgraded rail signal system. The National Environmental Policy Act of 1969 (NEPA) mandates the consideration of environmental impacts before approval of any federally funded project that may have significant impacts on the environment or where impacts have not yet been determined. FTA, Metra and Union Pacific prepared this Union Pacific West Line Third Mainline Track Project Documented Categorical Exclusion (DCE) in accordance with NEPA and other applicable regulations, including Section 106 of the National Historic Preservation Act (NHPA) and other agency regulations and guidelines. This DCE considers the impacts of implementing the proposed Project on the physical, human, and natural environments in the project area. On July 31, 2017, FTA found that the proposed Project meets the criteria for a Categorical Exclusion based on the significance of impacts identified during the NEPA process. FTA’s finding will guide final design and implementation of the Project. Metra and Union Pacific (UP) held an open house (Open House Invitation) to allow the public to view exhibits of the planned improvements, talk with project staff and provide comments. The open house was held on Thursday, September 21, 2017 from 5:30 p.m. to 7:30 p.m. in the Auditorium of the Kane County Government Center.